The Joint Center for Housing Studies at Harvard University released its 2016 State of the Nation’s Housing report this week, giving us a snapshot of the housing issues that plague many Americans. Affordable housing, concentrated poverty and the seemingly insurmountable obstacles to homeownership make the top of the list. On the bright side, the JCHS panelists and researchers concluded there are viable solutions to these issues — but they have to come from greater political involvement and strong legislative measures from our leaders.
.@loanDepot: 21% of Americans say candidates’ housing policies will influence their vote. This election cycle has Americans anxious about the overall future of the nation and the future of more personal matters such as their financial stability. Nearly 25 percent of voters think they’ll be in a worse place financially as the next president takes office. Furthermore, Democrats seem to be more worried about their financial futures, as 50 percent said they’ll be worse off compared to the 44 percent of Republicans who echoed the same sentiment. A mere 6 percent of Americans think they’ll be better off come 2016.
.@loanDepot: 25% of voters think they’ll be worse off financially when next president takes office. When it comes to the age demographics, millennials seem to be the most worried about the possibility of homeownership being snatched from them. Thirty-six percent of millennials said they don’t make enough money, and 46 percent are concerned about how the election will impact their ability to access credit for home loans. 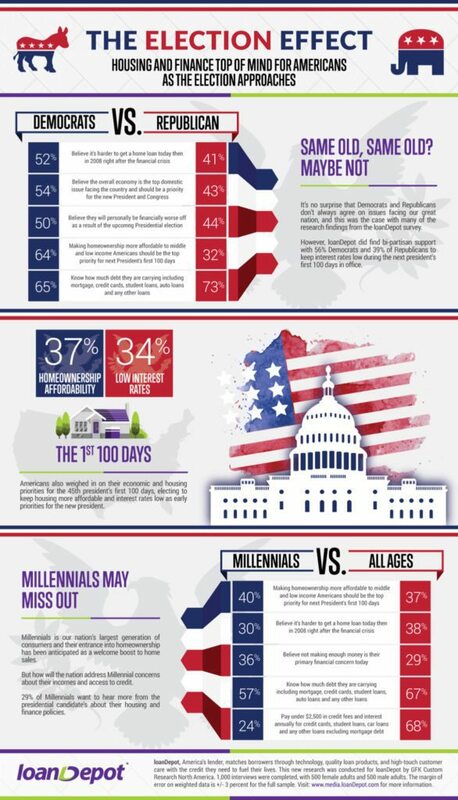 Lastly, 40 percent of millennials said the next president needs to focus on how to make housing more affordable for the middle and lower classes within the first 100 days.